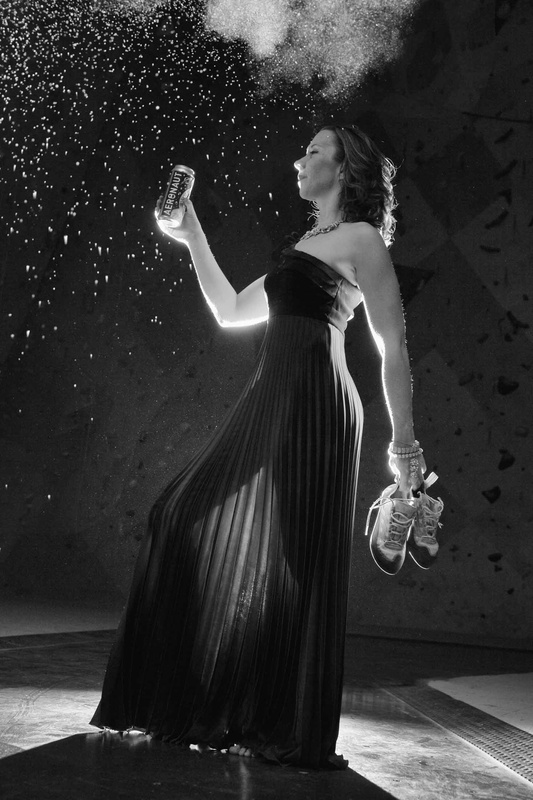 Aeronaut Brewery and Brooklyn Boulders are getting together to throw a New Years Eve bash. I had the good fortune to be at Opus Affair, drinking with Jason McCool mentioned where he was headed next. 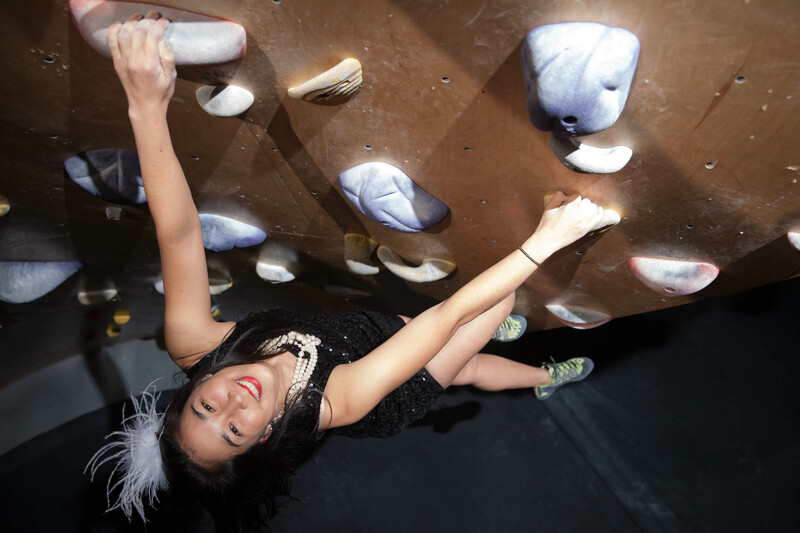 Climbers from BKBS were wearing formal wear and posing for photos to promote the party. 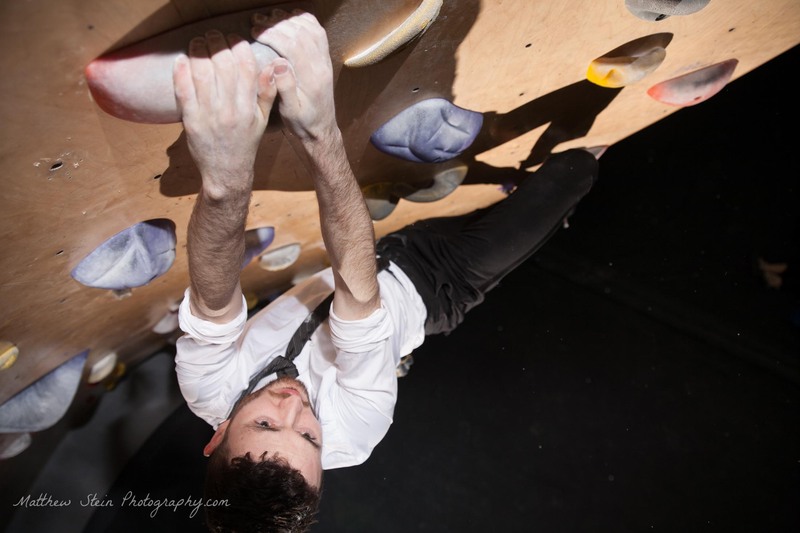 Climbing, photography and fancy dress? I'm in. Shooting rock climbers is challenging already. If you shoot from the ground looking up at their butts, then you'll see the same thing everyone always sees. Instead, shooting from above the climber offers a new perspective. One that most people never get to see. 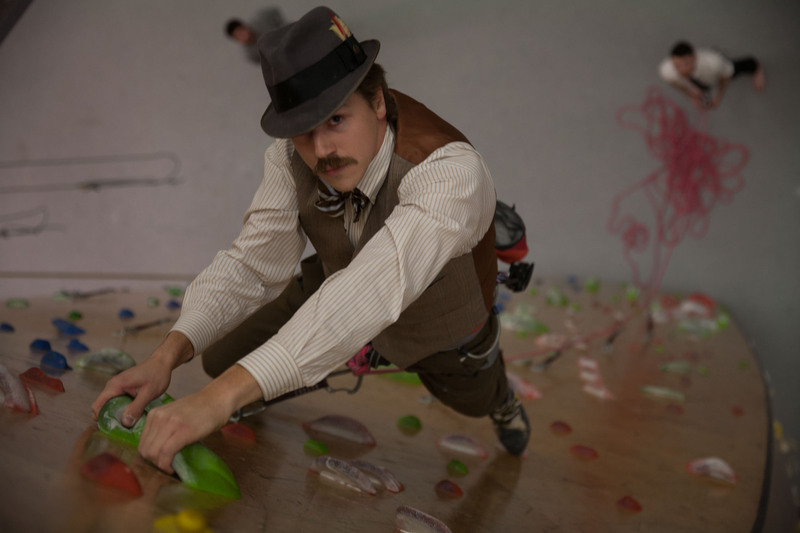 Plus, capturing their faces creates a real emotional connection between the viewer and the climber. Thats the shot you want. I grabbed my photo bag (always keep your batteries charged) and my climbing bag (rope, shoes, harness, chalk bag) and we got to the gym around 10:30pm. After a few rounds of cocktails at Stoddards, I knew this would get interesting. Unfortunately, I had to turn down offers of additional beers from Aeronaut until after this was wrapped. Logistics get complicated when you're not shooting from the ground. Here's how I thought about setting up each shot. Pick the handhold the climber would hang from. Guess what are the best framing options. Figure out where I need to be positioned to get the shot. Establish the best way to anchor and belay me so I don't die. Clip the camera to my harness, tie in, climb up and hope that I guessed correctly in all the previous steps. Once I'm on the wall, I can't just take a step to my left or right to change the framing. Up and down can change a little, but not much. I shot with a 24-70 zoom lens, which allowed some flexibility. Once the climber is in position, the clock is ticking. I can't just ask them to hang out indefinitely until I fiddle around with settings and positioning. I love shooting under this kind of pressure. These shots are for promoting a New Years Eve party. So, we wanted to have a mostly dark frame, with the subjects illuminated. I brought two flashes with remote triggers, but no light modifiers or stands. For a shot like this, I meticulously plan the lighting framing, and perspective options. No time for that today. We finished with a few more shots from the ground. Climbing chalk and flashes make a great combination. 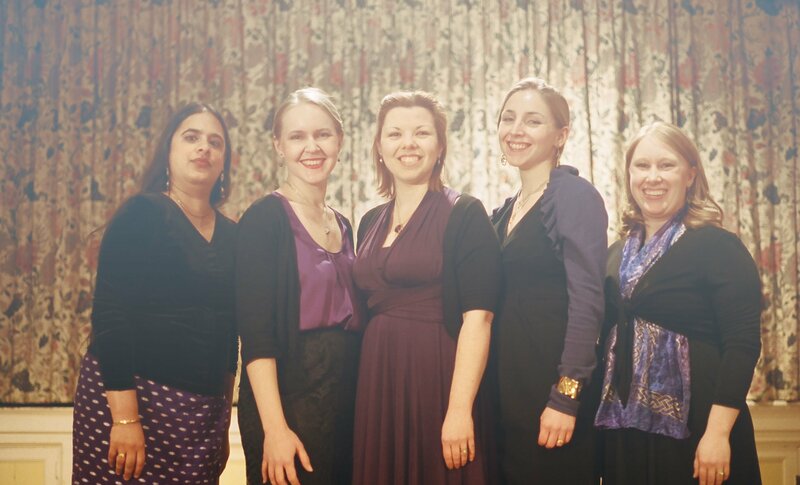 We got some group shots, and a poster-ready photo of Michelle, in the gown. Thanks to Luke for belaying me for extended periods of time, and all the people hanging around who were willing to grab a flash and follow directions. We wrapped the shoot just after 1:30am, and I finally enjoyed that beer. 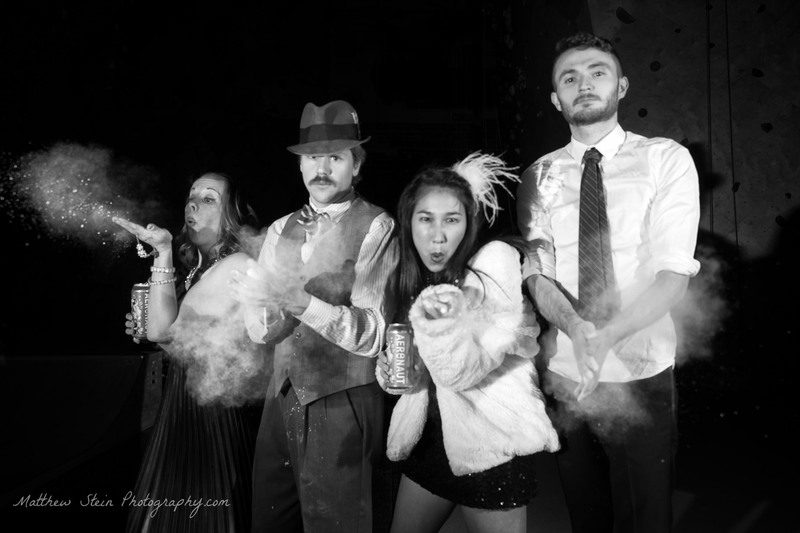 Do you need a photographer for an unusual creative project? Lets talk.